Tributes have flowed in following the passing of General Eva Burrows. It was 11:30pm on the 20th March, 2015, that the 85 year old General was promoted to glory. General Andre Cox has said, 'Salvationists around the world tonight are remembering, with fondness and warmth, The People’s General - in the person of General Eva Burrows, who was Promoted to Glory earlier today from her homeland of Australia. The 13th General of The Salvation Army (1986-1993), General Eva Burrows, AC, will be remembered as a valiant Christian soldier and leader who, through her selfless, thoughtful leadership, has left an indelible mark on The Salvation Army. Commissioner Floyd Tidd (Australia Southern Territory) said, "General Eva Burrows was an inspiring, respected and loved colleague with an exemplary record of international service for The Salvation Army. She led a faithful covenanted life as both an officer and a soldier. She was universally recognised as a very strong leader with a unique spiritual authority. She will be sorely missed." It's not just Salvationists who have poured out the tributes. Steve Lillibuen from The AGE newspaper has written a piece about the People's General. The Daily Telegraph have written about the leader that General Eva Burrows was. I have my own stories to tell, as do so many Salvationists the world over. I remember everytime I had a chat with General Eva, she would look at me, and ask me how Jo was (my wife) and how Craigieburn Corps was going. And by the way, how are the children? Many have memories of moments like these. Who would expect a retired General of the worldwide movement of The Salvation Army to remember you, care for you in those moments, know your current appointment and even take time to write emails to you when you have a child? This was exemplary, caring and compassionate leadership. General Eva Burrows loved Jesus, lived for Jesus and lived like Jesus. 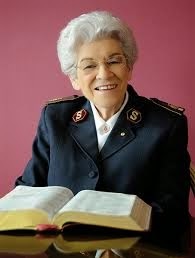 She has been an absolute inspiration to The Salvation Army and her legacy will live on for decades to come. 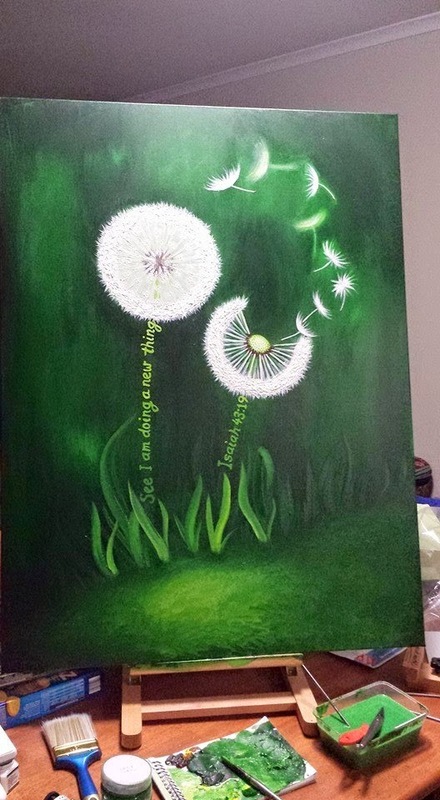 This painting is called "I am doing a new thing", and is dedicated to the life and memory of General Eva Burrows [rtd], a mighty woman of God who was promoted to glory as this painting was almost complete. May her memory spur many on - to live mightily for Jesus and in doing so, witness His "new thing" as it comes to pass in His Salvation Army. Let me finish by saying: One great privilege that we have as followers of Jesus, is to know Christ and to make him known. The other great privilege is that one day we will meet Christ face to face. General Eva Burrows has just had that privilege.